I have an impeccable wardrobe. Not impeccable as in perfectly tailored suits, mind you. It is impeccable in that it is perfect for the business casual work environment at LearnKey and for my second home, the golf course. I’m talking specifically about my belt collection. Yes, I have a brown belt and a black belt like most guys do, but, I also have white, silver, mocha, purple, deep purple, navy, light blue, green, lime, neon, orange, and red belts. I even have a white/blue two-tone belt which reverses to a black belt. Snazzy, huh? Most of my co-workers are very complimentary of my wardrobe. They know good taste when they see it. 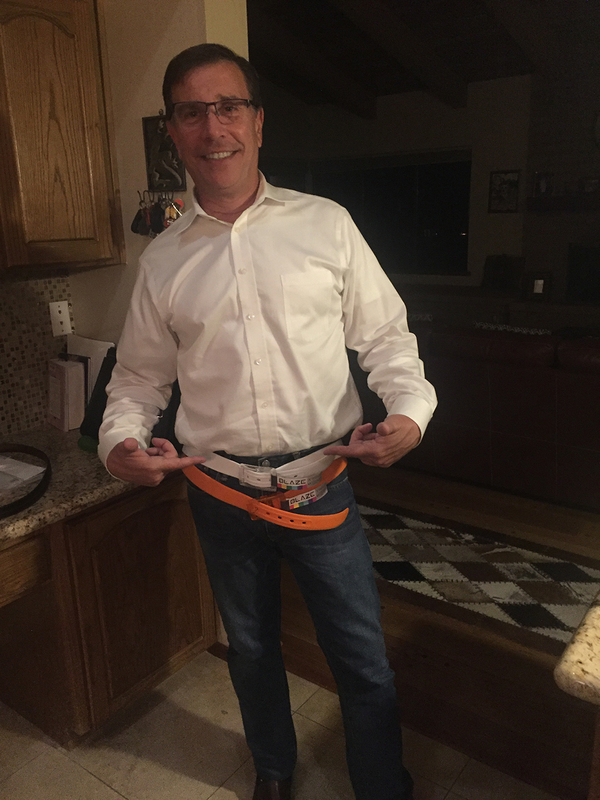 I said most because our fearless CEO, Jeff Coruccini, for the longest time failed to see the light on my colorful belts. Every time he flew up, he flat ridiculed my belts. This after I made it a point to make sure he always saw a new one for several straight trips. Spending 15 years in classroom training before coming here two years ago, I learned to read people well, so where I heard ridicule from Jeff, I felt a sense of his wishing he could pull off the look I pull off so effortlessly. Just look at the joy on his face knowing that one day, he will have that impeccable wardrobe, just like I do. So, what does this have to do with employability and certifications and a workplace in general? Actually, there is a point here: We here at LearnKey work hard, very hard, to create the best possible courses we can to improve employability and certification prospects for all of you. But in all that hard work, we allow for fun. We allow for laughing at ourselves and with each other. And just having that attitude about life will make you more employable…every day. And, you will enjoy life that much more. How many of you remember when Macromedia Flash first became a big “thing” on the Internet? No? How about Adobe Flash? Maybe? How about this question: How many of you feel skunked when you tap to a website on your mobile device only to get the dreaded message, “Your browser does not support Flash”? Well, you’re not alone if this has happened to you. And just as Flash was the big thing years ago, HTML5 is now. However, Flash and HTML5 did not really work well together, because, to export from Flash, you had to get a plug-in or tool or some kind of extension. It just wasn’t a smooth, seamless process. Fortunately, those days are over. What was once known as Adobe Flash is now Adobe Animate, one of the newest additions to the Adobe suite of programs. In a nutshell, Adobe Animate is Flash plus the ability to easily create files for ActionScript (the native Flash format), HTML5, and WebGL (Web Graphics Library). With a new program comes a brand new Adobe Animate course, due to launch late spring/early summer. This course is going to be a thorough, yet clear and concise, introduction to Adobe Animate and will serve two purposes: to improve your employability skills in the areas of web and graphic design as they relate to Adobe Animate, and to get you prepared to pass the Adobe Certified Associate in Multiplatform Animations using Adobe Animate CC exam and obtain your ACA in Animate. To cover these, we will have several (but not too many) hours of video training, pre-assessment and post-assessment tests, practice labs, and a project workbook full of practice exercises. All of these tools are here to, again, increase your employability prospects and help you obtain the Animate CC ACA certification. Finally, for those of you wondering which version of Animate we will be covering, technically the course is going to be built for the latest certification offering, which is Animate CC 2015, but the course will work just as well for anyone trying to learn Animate CC 2017. Whenever I am asked to write an entry for this blog, I usually do the writing mid-week. But, last week our great crew was busy filming the course I get to tell you about today, and that is the updated version of the MTA (Microsoft Technology Associate) Operating System Fundamentals course, which maps to MTA exam 98-349. Most of the time, when we put together a new version of a course, it is for a new exam (specifically name or number). This time, though, the exam name and number are the same. What changed, then? Oh, about half of the test objectives as the exam has been updated to include Windows 10 content and remove content that just applied to Windows 7. For example, exam topics such as Aero configurations, Windows Media Center, and Windows XP mode are all gone as they are not in Windows 10, but features such as Insider Preview, Current Branch, and Windows Store apps are exam topics. Furthermore, the wording of many exam topics has changed to “Configure….” rather than “Understand…”, placing a greater emphasis on knowing how to do operating system configurations in Windows 10, not just knowing what they are. This course covers these domains thoroughly, through the video training (which we just completed filming), pre-assessment and post-assessment tests, practice labs, and a project workbook with plenty of practice exercises for configuring Windows 10. All of these tools will help you pass the 98-349 exam and increase your employability as, according to Microsoft, Windows 10 has been deployed to over 400 million devices in its first year of release. Thus, businesses which need desktop support technicians and computer repair shops definitely need people who are skilled in configuring Windows 10, which this course and certification will provide. Hello again from your humble Senior Instructor. You may have noticed over the past several months a series of test prep courses we have released, all tied toward the new Adobe CC 2015 ACA (Adobe Certified Associate) exams. I wrote about the changes to the exams a while back, and, we have released test prep courses for Photoshop, Illustrator, InDesign, and Dreamweaver. Our test prep courses are different than a full-featured course in that we focus solely on what you need to know to pass the exam, not so much on full coverage on how to use the program. Why have we done that for Adobe CC 2015? The reason is simple: There really is not much difference between Adobe CC and Adobe CC 2015. And, we already have full courses for the Adobe CC suite, authored by highly talented Adobe specialists, including Chad Chelius (Dreamweaver and Photoshop), Lee Wiley (Illustrator), Linda Dickeson (InDesign), and Ryan James (Premiere). The sole purpose of the test prep courses is to fill in the gaps for the new objectives for the Adobe CC 2015 tests, and provide a little review on basic concepts for these programs, as they relate to the exam objectives. We do have a pre-assessment, post-assessment, labs, and a project workbook to accompany each of these test prep courses, and these tools also map to the exam objectives. Study the objective list top to bottom. For all five exams, one domain covers project terms and definitions. Do not gloss over this! This is 20% or so of each exam. Put yourself in the shoes of a real-life professional for whatever exam you are taking. For example, if you are taking the Illustrator exam, you’re a graphic designer for the day. Many of the exam questions are scenario-based, meaning that you need to read about a situation and choose the correct answer accordingly. Yes, the test questions still map very well to the objectives, but the test is there to make sure you can identify what to do in a real-life situation. For whatever program you are studying, make sure you can do tasks different ways, especially through using the Tools panel and the icons on the panel. Do not count on being able to use keyboard shortcuts to answer test questions (many Mac users I know cringe at the very thought of this, but, that is reality). If you get stuck on a question, mark it for review, make your best guess, and move on. Being that the exam is about half simulation-based, it is easy to get trapped for several minutes on a question to where you are trying to remember how to do what is asked. Avoid that trap. Your time management on the exam will be better for it. And, remember that you can miss a few questions and still pass. I had a few “uh oh, what do I do” questions on these exams and still passed each one on the first try. If I can do it, so can you. And with that, the best of luck to you in your pursuit of the Adobe ACA CC 2015 certifications! In my 15+ years of classroom training, and my now-nearly 1.5 years as LearnKey’s Senior Instructor (see the asymmetry in numbers there? ), I have obtained many Microsoft certifications. What I always found challenging at times (besides the exams themselves) is having to figure out which test goes with which certification, and which tests I need to take (or can take as electives) in order to obtain a certain certification I have wanted or needed. While I was able to figure things out, it often took, well, more time than I wanted to spend reading a certification road map. Mobility – Focuses on Windows 10 installation and configuration and configuring Windows devices. Cloud Platform and Infrastructure – Focuses mainly on Windows Server 2012 and Server 2016 (which has exams in beta as I write this), and Microsoft Azure. Productivity Path – Similar to Cloud Platform and Infrastructure, but swap Microsoft Azure for Office 365. Data Management and Analytics Path – Focuses on SQL Server, SQL Server, and…you can guess the third one (hint: SQL Server). App Builder Path – The path for programmers and aspiring programmers, as it covers web development, C#, and mobile apps, just to name a few. Now, getting down to five certification paths is, well, really nice. But there is more to this streamlining process. Each certification path has a set of two or three exams to earn an MCSA (Microsoft Certified Solutions Associate). The Mobility path has just one MCSA (for Windows 10) while the others have multiple MCSA possibilities. Once an MCSA is obtained, you will need to take a single elective exam (and most of these paths have multiple choices) to then obtain your MCSE (Microsoft Certified Solutions Expert) or, as is the case with the App Builder path, an MCSD (Microsoft Certified Solutions Developer). And, here is the big catch: to keep your MCSE/MCSD current, you need to pass one elective exam each year. This helps keep people current with these certifications. So, to summarize: five certification paths, a handful of exams for each to reach MCSA status, an additional elective exam to move up to MCSE/MCSD status, and then passing an elective exam each year holds your MCSE/MCSD status. Streamlining indeed! And, we at LearnKey are going to be “freshening up” our Microsoft certification offerings over the next several months to best align our courseware with these new paths. Finally, here is a link to the details of what I’ve discussed in this blog: https://borntolearn.mslearn.net/b/weblog/posts/microsoft-streamlines-technical-certifications. Next week, I will bring you some news regarding Microsoft certifications and earning badges with certain certifications. Yes, these are badges you can use to broadcast your certifications all over social media. In the meantime, best of luck in your certification studies!